Another veteran defender is set to look for a new gig. ESPN’s Adam Schefter reports (via Twitter) that the Vikings are releasing defensive end Brian Robison. The 2007 fourth-round pick had spent his entire career in Minnesota, missing only a pair of regular season games during his 11 years in the NFL. After having been a starter from 2011 through 2016, Robison was demoted to a backup role last season. In 15 games (one start), the 35-year-old compiled only 20 tackles, his lowest total since 2010. However, despite his limited snaps, the veteran still managed to get at the quarterback, as he finished the year with four sacks. 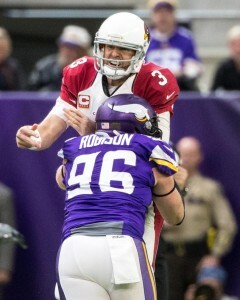 Robison will finish his career in Minnesota tied for fifth in franchise history with 60 career sacks. With Robison out of the picture, the team will now presumably turn to fourth-round rookie Jalyn Holmes as the primary backup to Danielle Hunter and Everson Griffen. 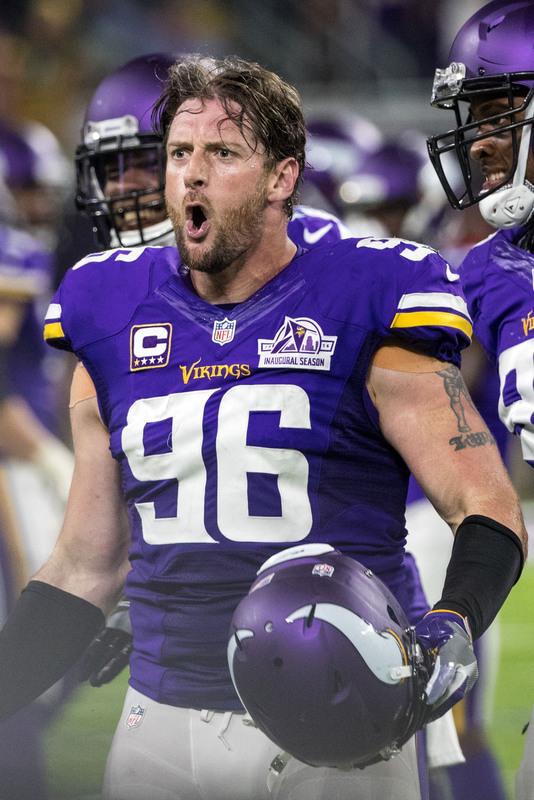 Last month, it was announced that Vikings defensive end Brian Robison was taking a pay cut to stay with the team in the final year of his contract. The longtime Viking was scheduled to make $3.5MM initially, but his pay cut reduced his base salary to $1.015MM plus a $90K workout bonus. Now Robison, who has been with the Vikings since being drafted by the team in the fourth round back in 2007, appears ready to hang up his cleats. He recently told Chris Tomasson of the St. Paul Pioneer Press that he’ll “more than likely” retire after the 2018 season. If the 2018 season is indeed Robison’s last in the NFL, it will be the end to an unusually long run with a single team for a role player. Normally only a star player would wind up playing for the same team for 12 seasons, but Robison has carved out a similar situational pass-rushing role with the Vikings year after year through multiple coaching staffs and front offices. He has 60 sacks, 19 passes defended, and 13 forced fumbles throughout his career, only missing three of a possible 176 games since entering the league. Vikings first-round cornerback Mike Hughes is “pretty close” to signing his rookie deal, Hughes told Tomasson. Hughes, the only Vikings draft pick yet to sign, was taken with the 30th overall pick in April’s draft out of Central Florida. Tomasson reports that rookie kicker Daniel Carlson “has looked better than Kai Forbath in the battle to be Minnesota’s kicker.” Since the Vikings used a fifth-rounder on Carlson, they likely have every intention of having him be their kicker. Forbath, the incumbent, was underwhelming last year and appears likely to be cut. Pro Bowl tight end Kyle Rudolph is working his way back from offseason ankle surgery, and recently returned to the field. Tomasson notes that Rudolph is ahead of schedule in his recovery and wasn’t supposed to get back to work for a few more weeks. Brian Robison has decided to play at least one more season. The Vikings defensive end and the franchise’s longest-tenured active player announced (via Twitter) on Monday he will return to the team. The 2007 draftee wavered on a previous stance that indicated he would play through the 2018 season, commenting after the Vikings’ season concluded that it wasn’t a surefire proposition he would return. Now, the 35-year-old defender will try for another season in Minnesota. Having played in all but three games since the start of the 2007 season, Robison ranks fifth in Vikings history with 60 sacks. He stands to occupy a depth role again on Minnesota’s defensive line, being stationed behind Everson Griffen and Danielle Hunter on the depth chart. Robison moved back into a bench role after being a full-time starter from 2011-16. Nevertheless, Robison enjoyed a busy workload last season, playing 642 snaps. However, the Vikings also drafted two defensive ends this year — in fourth-rounder Jalyn Holmes and sixth-rounder Ade Aruna — so the franchise is preparing for Robison’s eventual departure. Robison stands to make $3.2MM in base salary as a part of his revised contract. Remember Zac Stacy? The former Rams and Jets running back is attempting an NFL comeback, according to Cameron Wolfe of ESPN.com (Twitter link), who spotted Stacy at Vanderbilt’s Pro Day earlier today. Stacy, who turns 27 next month, hasn’t played since 2015, and announced his retirement at this time last year following an ankle injury. The Rams’ starter as a rookie in 2013, Stacy racked up 973 yards and seven touchdowns during his only campaign as a team’s primary back. New York eventually acquired Stacy for a seventh-round pick, but he managed only 31 total rushes before hanging up his cleats. Now that Kirk Cousins is closing in on a fully guaranteed deal with the Vikings, at least one source tells Chris Tomasson of the St. Paul Pioneer Press (Twitter link) that Minnesota could ask running back Latavius Murray or defensive end Brian Robison to accept a pay cut in 2018. Murray got into the end zone eight times in 2017, but he’s due to count more than $6MM on next year’s cap and isn’t a lock to start given that rookie sensation Dalvin Cook will return from injury. Robison, meanwhile, hasn’t even decided if he’ll play during the upcoming season. If he retires, the Vikings will pick up $3.488MM in cap space, the same total as if he retires. Guard Andrew Norwell was considered the Giants‘ primary free agent target this offseason, and while he ultimately landed with the Jaguars, New York’s offer was close if not the same as Jacksonville’s, tweets Jordan Raanan of ESPN.com. Norwell is now the league’s highest-paid after receiving $13MM annually (and $30MM guaranteed) on a five-year deal. New Giants general manager Dave Gettleman originally signed Norwell as an undrafted free agent in Carolina, so the connection made plenty of sense, but Norwell simply chose the Jaguars, per Raanan. New details have emerged on veteran safety Kurt Coleman‘s three-year deal with the Saints, as Josh Katzenstein of NOLA.com writes. In total, the pact is worth $16.35MM, but Coleman can earn another $2.25MM via incentives. Coleman will collect $6.2MM in full guarantees, $4.5MM of which will come in the form of a signing bonus. However, Coleman’s new contract is heavily back-loaded, as his 2018 cap charge is just $3.3MM. New Orleans will have a decision to make in 2019, as Coleman has a $500K roster bonus on the third day of the league year — he could be released with $3MM in dead money accelerating onto the club’s cap. The Vikings came just short of reaching the Super Bowl this year and it’s not clear whether Brian Robison will be a part of the redemption effort next season. In a radio interview on Monday, the defensive end said that he is pondering retirement. Last spring, Robison inked an extension with the team to take him through the 2018 season. At the time, he said that he would retire after the ’18 campaign. Now, those plans might be accelerated. Robison will turn 35 in April and the longtime starter is showing signs of decline. After starting nearly every game for Minnesota from 2011-2016, the veteran made just one start in 2017. His four sacks and 20 tackles were his lowest posting since 2010 and his 53.4 overall score from Pro Football Focus portrayed him as a below-average edge defender. Robison is due a base salary of $3.2MM in 2018 with $1.25MM guaranteed, plus $200K in per-game roster bonuses and $100K through a workout bonus. Even if Robison decides to continue playing, the team may choose to move on from him and save ~$2MM. Brian Robison signed a contract extension that could allow him the opportunity to retire as a Viking, the same way Chad Greenway did. As of now, the veteran defensive end does not plan to play beyond that contract. This will be Robison’s 11th season, and the 34-year-old defender told Chris Tomasson of the St. Paul Pioneer Press the 2018 season will likely be his last. Having arrived in the same draft class with Adrian Peterson, Robison is set to outlast the future Hall of Famer in purple. He is now the longest-tenured player on the team after Greenway retired. Robison’s contract now runs through 2017, with an overall pay reduction being agreed upon in exchange for an extra year and more guaranteed dollars. Robison expected the Vikings to call about a renegotiation, per Tomasson, and the result gave Minnesota $1.8MM in additional cap space. The former fourth-round pick registered 7.5 sacks last season and made 16 starts for the Vikings. Since commandeering a starting end job in 2011, Robison has missed just one start. Robison acknowledged third-year player Danielle Hunter could be in position to snare his starting job at some point in the near future, but the veteran’s skill set could probably be used as a pass-rushing-specific capacity in that event. Defensive end Brian Robison has agreed to a contract extension with the Vikings, Field Yates of ESPN.com tweets. In essence, it all amounts to a pay cut. Robison was previously slated to make up to $5.6MM for 2017, with no guaranteed money. Now, he’ll see his base salary go from a non-guaranteed $5.3MM to a fully guaranteed $3.9MM. He can add $100K through a workout bonus, but he forfeits $200K in per-game roster bonuses. Then, in his additional year (2018), he’ll get a base salary of $3.2MM with $1.25MM guaranteed. He can also add $200K in per-game roster bonuses and $100K through a workout bonus. The overall two-year deal has a $7.5MM base value with $5.15MM guaranteed. Robison has effectively consented to a $1.4MM pay cut in 2017 to add an extra year to his pact. Robison, 34 in April, had 28 total tackles and 7.5 sacks in 2016. Even at his age, Robison has shown to be both effective and durable. He has averaged 7.0 sacks per season since 2011 and appeared in all but one regular season game for the Vikings during that time. The new deal could allow the lifetime member of the Vikings to retire in purple. Then again, as he continues to rack up sacks, Robison might want to continue playing beyond 2018.